Filterstation is a stereo filter plug-in, with built in envelope filter and LFO based on the Sherman Filterbank. 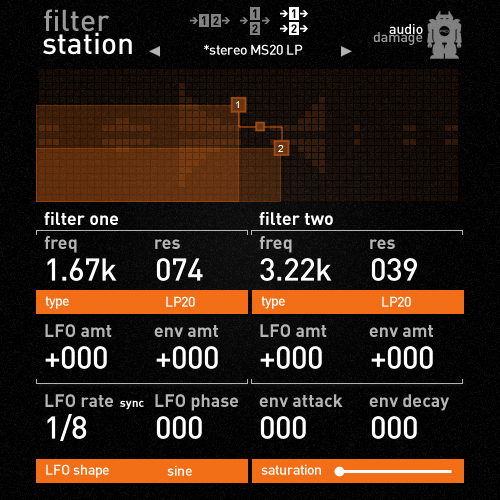 Filterstation has a classic serial/parallel/stereo dual filter topology based on classic . It features twelve filter algorithms, saturation and an envelope follower. It includes Audio Damage' MS20 lowpass and highpass emulations. Filterstation sports an easy to use interface, which will make it easier for you to start your "noink", in no time. Serial, parallel, and true stereo operating modes.